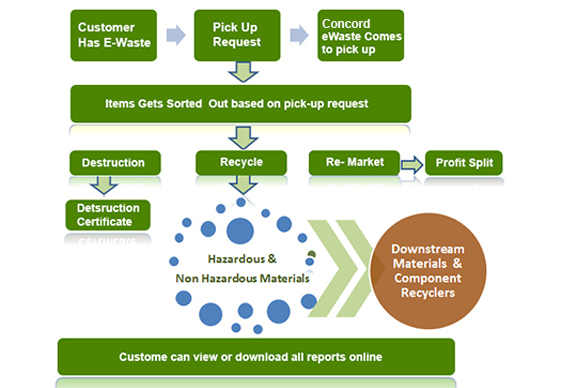 The recycling process of our company includes the 4 step procedure which has all the details with proper precision and care. We ensure to transport all your electronic assets in a secure and safe way to our warehouse and from there our end services also provide the safe disposal of data and equipment. You can easily count on us if you want efficient and good services for recycling. Our highly experienced and professional staff knows the ways to make the recycling process easy, transparent, secure and hassle-free. All you are required to do is to just identify the waste disposal need of yours and by calling us you can easily request a pick up for the same. Along with this, you can also schedule a pick and our respective team will be available for the pickup. The professionals of our company who will visit you, they will ensure to sort all the items and they will also identify whether they should be destroyed, recycled, or remarketed. The entire destruction process is very cost-effective and eco-friendly as well. We also provide a certificate for the items which are destroyed. In case there in an item which requires recycling then it will be torn locally and nothing will go in the landfill. In case our team find that there is something worth of remarketing then we will ensure to inform you about it along with a detailed plan and the profit sharing will be discussed online.